What does the if __name__ == "__main__": do? it executes all of the code found in the file. Let's see how this works and how it relates to your question about the __name__ checks we always see in Python scripts. Let's use a slightly different code sample to explore how imports and scripts work. Suppose the following is in a file called foo.py. # Suppose this is foo.py. When the Python interpeter reads a source file, it first defines a few special variables. In this case, we care about the __name__ variable. If you are running your module (the source file) as the main program, e.g. the interpreter will assign the hard-coded string "__main__" to the __name__ variable, i.e. # of your module when run as the main program. # Suppose this is in some other main program. In this case, the interpreter will look at the filename of your module, foo.py, strip off the .py, and assign that string to your module's __name__ variable, i.e. # of your module when it's imported from another module. After the special variables are set up, the interpreter executes all the code in the module, one statement at a time. You may want to open another window on the side with the code sample so you can follow along with this explanation. It prints the string "before import" (without quotes). # then assign it to a local variable called math. It prints the string "before functionA". It executes the def block, creating a function object, then assigning that function object to a variable called functionA. It prints the string "before functionB". It executes the second def block, creating another function object, then assigning it to a variable called functionB. It prints the string "before __name__ guard". 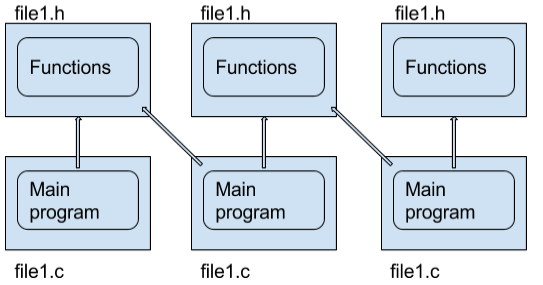 If your module is the main program, then it will see that __name__ was indeed set to "__main__" and it calls the two functions, printing the strings "Function A" and "Function B 10.0". (instead) If your module is not the main program but was imported by another one, then __name__ will be "foo", not "__main__", and it'll skip the body of the if statement. It will print the string "after __name__ guard" in both situations. Your module is only used as a main program, but it has some unit tests, and the testing framework works by importing .py files like your script and running special test functions. You don't want it to try running the script just because it's importing the module. Your module is mostly used as a main program, but it also provides a programmer-friendly API for advanced users. Beyond those examples, it's elegant that running a script in Python is just setting up a few magic variables and importing the script. "Running" the script is a side effect of importing the script's module. Question: Can I have multiple __name__ checking blocks? Answer: it's strange to do so, but the language won't stop you. Suppose the following is in foo2.py. What happens if you say python foo2.py on the command-line? Why? # Suppose this is foo2.py. # Suppose this is foo3.py. What will this do when used as a script? When imported as a module? all of the code that is at indentation level 0 gets executed. Functions and classes that are defined are, well, defined, but none of their code gets run. Unlike other languages, there's no main() function that gets run automatically - the main() function is implicitly all the code at the top level. Thus, when module one gets loaded, its __name__ equals "one" instead of "__main__". As you can see, when a module is imported, Python sets globals()['__name__'] in this module to the module's name. Also, upon import all the code in the module is being run. As the if statement evaluates to False this part is not executed. As you can see, when a file is executed, Python sets globals()['__name__'] in this file to "__main__". This time, the if statement evaluates to True and is being run. The global variable, __name__, in the module that is the entry point to your program, is '__main__'. Otherwise, it's the name you import the module by. So, code under the if block will only run if the module is the entry point to your program. It allows the code in the module to be importable by other modules, without executing the code block beneath on import. On import, the do_important function would be called, so you'd probably comment out your function call, do_important(), at the bottom. And then you'll have to remember whether or not you've commented out your test function call. And this extra complexity would mean you're likely to forget, making your development process more troublesome. The __name__ variable points to the namespace wherever the Python interpreter happens to be at the moment. Inside an imported module, it's the name of that module. But inside the primary module (or an interactive Python session, i.e. the interpreter's Read, Eval, Print Loop, or REPL) you are running everything from its "__main__". With the above, your code will only execute when you're running it as the primary module (or intentionally call it from another script). There's a Pythonic way to improve on this, though. What if we want to run this business process from outside the module? We now have a final function for the end of our module that will run if we run the module as the primary module. It will allow the module and its functions and classes to be imported into other scripts without running the main function, and will also allow the module (and its functions and classes) to be called when running from a different '__main__' module, i.e. if __name__ == "__main__" is the part that runs when the script is run from (say) the command line using a command like python myscript.py. __name__ is a global variable (in Python, global actually means on the module level) that exists in all namespaces. It is typically the module's name (as a str type). the otherwise anonymous global namespace is assigned the value of '__main__' to its __name__. will cause your script's uniquely defined main function to run. There are lots of different takes here on the mechanics of the code in question, the "How", but for me none of it made sense until I understood the "Why". This should be especially helpful for new programmers. What is this code actually doing? When you execute xy.py, you import ab. The import statement runs the module immediately on import, so ab's operations get executed before the remainder of xy's. Once finished with ab, it continues with xy. The interpreter keeps track of which scripts are running with __name__. When you run a script - no matter what you've named it - the interpreter calls it "__main__", making it the master or 'home' script that gets returned to after running an external script. Any other script that's called from this "__main__" script is assigned its filename as its __name__ (e.g., __name__ == "ab.py"). Hence, the line if __name__ == "__main__": is the interpreter's test to determine if it's interpreting/parsing the 'home' script that was initially executed, or if it's temporarily peeking into another (external) script. This gives the programmer flexibility to have the script behave differently if it's executed directly vs. called externally. Open xy.py as the 'home' file; call it "__main__" in the __name__ variable. Import and open file with the __name__ == "ab.py". Oh, a function. I'll remember that. Ok, function a(); I just learned that. Printing 'A function in ab file'. End of file; back to "__main__"! Function x(); ok, printing 'peripheral task: might be useful in other projects'. What's this? An if statement. Well, the condition has been met (the variable __name__ has been set to "__main__"), so I'll enter the main() function and print 'main function: this is where the action is'. The bottom two lines mean: "If this is the "__main__" or 'home' script, execute the function called main()". That's why you'll see a def main(): block up top, which contains the main flow of the script's functionality. Remember what I said earlier about import statements? When you import a module it doesn't just 'recognize' it and wait for further instructions - it actually runs all the executable operations contained within the script. So, putting the meat of your script into the main() function effectively quarantines it, putting it in isolation so that it won't immediately run when imported by another script. Yes, that's right. These separate functions can be called from an in-line script that's not contained inside a main() function. If you're accustomed (as I am, in my early learning stages of programming) to building in-line scripts that do exactly what you need, and you'll try to figure it out again if you ever need that operation again ... well, you're not used to this kind of internal structure to your code, because it's more complicated to build and it's not as intuitive to read. But that's a script that probably can't have its functions called externally, because if it did it would immediately start calculating and assigning variables. And chances are if you're trying to re-use a function, your new script is related closely enough to the old one that there will be conflicting variables. When there are certain statements in our module (M.py) we want to be executed when it'll be running as main (not imported), we can place those statements (test-cases, print statements) under this if block. As by default (when module running as main, not imported) the __name__ variable is set to "__main__", and when it'll be imported the __name__ variable will get a different value, most probably the name of the module ('M'). This is helpful in running different variants of a modules together, and separating their specific input & output statements and also if there are any test-cases. In short, use this 'if __name__ == "main" ' block to prevent (certain) code from being run when the module is imported. Blocks A and B are run when we are running "x.py". But just block A (and not B) is run when we are running another module, "y.py" for example, in which x.y is imported and the code is run from there (like when a function in "x.py" is called from y.py). Put simply, __name__ is a variable defined for each script that defines whether the script is being run as the main module or it is being run as an imported module. As you can see, __name__ tells us which code is the 'main' module. This is great, because you can just write code and not have to worry about structural issues like in C/C++, where, if a file does not implement a 'main' function then it cannot be compiled as an executable and if it does, it cannot then be used as a library. You write a module, and if someone wants to use your code they just import it and the __name__ variable can help to separate the executable portion of the program from the library part. It checks if the __name__ attribute of the Python script is "__main__". In other words, if the program itself is executed, the attribute will be __main__, so the program will be executed (in this case the main() function). However, if your Python script is used by a module, any code outside of the if statement will be executed, so if \__name__ == "\__main__" is used just to check if the program is used as a module or not, and therefore decides whether to run the code. Before explaining anything about if __name__ == '__main__' it is important to understand what __name__ is and what it does. __name__ is a DunderAlias - can be thought of as a global variable (accessible from modules) and works in a similar way to global. It is a string (global as mentioned above) as indicated by type(__name__) (yielding <class 'str'>), and is an inbuilt standard for both Python 3 and Python 2 versions. It can not only be used in scripts but can also be found in both the interpreter and modules/packages. Notice that when used in a package or module, __name__ takes the name of the file. The path of the actual module or package path is not given, but has its own DunderAlias __file__, that allows for this. You should see that, where __name__, where it is the main file (or program) will always return __main__, and if it is a module/package, or anything that is running off some other Python script, will return the name of the file where it has originated from. Being a variable means that it's value can be overwritten ("can" does not mean "should"), overwriting the value of __name__ will result in a lack of readability. So do not do it, for any reason. If you need a variable define a new variable. It is always assumed that the value of __name__ to be __main__ or the name of the file. Once again changing this default value will cause more confusion that it will do good, causing problems further down the line. It is considered good practice in general to include the if __name__ == '__main__' in scripts. An if is a flow control statement that contains the block of code will execute if the value given is true. We have seen that __name__ can take either __main__ or the file name it has been imported from. This means that if __name__ is equal to __main__ then the file must be the main file and must actually be running (or it is the interpreter), not a module or package imported into the script. If indeed __name__ does take the value of __main__ then whatever is in that block of code will execute. This tells us that if the file running is the main file (or you are running from the interpreter directly) then that condition must execute. If it is a package then it should not, and the value will not be __main__. You can also use it to provide runnable help functions/utilities on packages and modules without the elaborate use of libraries. It also allows modules to be run from the command line as main scripts, which can be also very useful. __name__: Every module in Python has a special attribute called __name__. It is a built-in variable that returns the name of the module. __main__: Like other programming languages, Python too has an execution entry point, i.e., main. '__main__' is the name of the scope in which top-level code executes. Basically you have two ways of using a Python module: Run it directly as a script, or import it. When a module is run as a script, its __name__ is set to __main__. Thus, the value of the __name__ attribute is set to __main__ when the module is run as the main program. Otherwise the value of __name__ is set to contain the name of the module. It is a special for when a Python file is called from the command line. This is typically used to call a "main()" function or execute other appropriate startup code, like commandline arguments handling for instance. I am not saying you should use this in production code, but it serves to illustrate that there is nothing "magical" about if __name__ == '__main__'. It is a good convention for invoking a main function in Python files. Before the interpreter executes the source code file though, it defines a few special variables for that file; __name__ is one of those special variables that Python automatically defines for each source code file. If Python is loading this source code file as the main program (i.e. the file you run), then it sets the special __name__ variable for this file to have a value "__main__". If this is being imported from another module, __name__ will be set to that module's name. will be executed only when you run the module directly; the code block will not execute if another module is calling/importing it because the value of __name__ will not equal to "main" in that particular instance. if __name__ == "__main__": is basically the top-level script environment, and it specifies the interpreter that ('I have the highest priority to be executed first'). is primarily to avoid the import lock problems that would arise from having code directly imported. You want main() to run if your file was directly invoked (that's the __name__ == "__main__" case), but if your code was imported then the importer has to enter your code from the true main module to avoid import lock problems. A side-effect is that you automatically sign on to a methodology that supports multiple entry points. You can run your program using main() as the entry point, but you don't have to. While setup.py expects main(), other tools use alternate entry points. For example, to run your file as a gunicorn process, you define an app() function instead of a main(). Just as with setup.py, gunicorn imports your code so you don't want it do do anything while it's being imported (because of the import lock issue). I've been reading so much throughout the answers on this page. I would say, if you know the thing, for sure you will understand those answers, otherwise, you are still confused. import a action actually runs all that can be ran in "a"
The important thing that python is special at is point 4! The rest is just basic logic. You can make the file usable as a script as well as an importable module. The output for the above is __main__. The above statement is true and prints "direct method". Suppose if they imported this class in another class it doesn't print "direct method" because, while importing, it will set __name__ equal to "first model name". Call the class from other files. You just have to import it in the calling program. Run the class stand alone, for testing purposes. For the latter case, the class should contain a public static void main() method. In Python this purpose is served by the globally defined label '__main__'. If this .py file are imported by other .py files, the code under "the if statement" will not be executed. If this .py are run by python this_py.py under shell, or double clicked in Windows. the code under "the if statement" will be executed. It is usually written for testing. __name__ is always equal to __main__ whenever that file is run directly showing that this is the main file. Run it. It will print a, i.e., the name of the file which is imported. We see if __name__ == '__main__': quite often. It checks if a module is being imported or not. In other words, the code within the if block will be executed only when the code runs directly. Here directly means not imported. All the answers have pretty much explained the functionality. But I will provide one example of its usage which might help clearing out the concept further. Assume that you have two Python files, a.py and b.py. Now, a.py imports b.py. We run the a.py file, where the "import b.py" code is executed first. Before the rest of the a.py code runs, the code in the file b.py must run completely. In the b.py code there is some code that is exclusive to that file b.py and we don't want any other file (other than b.py file), that has imported the b.py file, to run it. So that is what this line of code checks. If it is the main file (i.e., b.py) running the code, which in this case it is not (a.py is the main file running), then only the code gets executed. Simply it is the entry point to run the file like the main function in the C programming language. Not the answer you're looking for? Browse other questions tagged python namespaces main python-module idioms or ask your own question. What's the point of a main function and/or __name__ == “__main__” check in Python? What does `if name == “__main__”` mean in Python? I don't understand Python's main block. What is that thing? Do you need to use __name__=__main__ statement for running any script in python?